Here is a quick introduction to using the LC Technology RW1820 temperature module. We aim to provide you with the tools you require to start measuring temperatures. 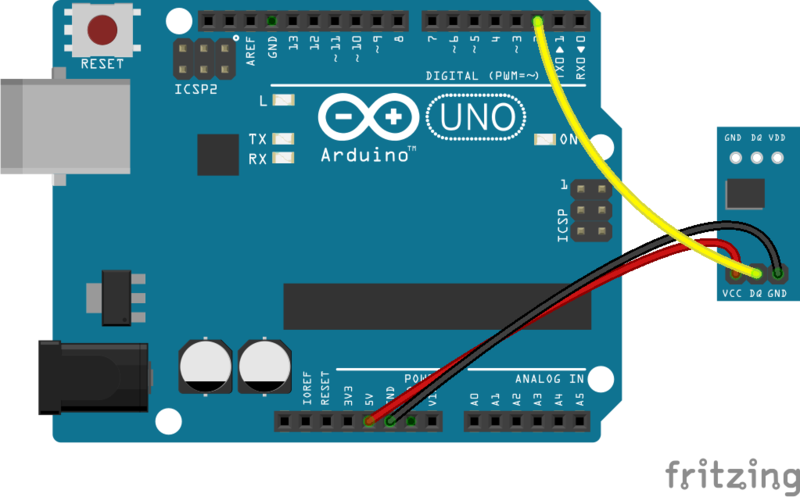 This example will demonstrate the use of an Arduino UNO in requesting and interpreting data from a RW1820 sensor module. Once connected and the first program loaded, the serial monitor will display a live temperature readout. This will use the OneWire library created by Paul Stoffregen and the DallasTemperature library created by Miles Burton. The code consists of the an include, definition, launch, setup and loop. First the OneWire library and the DallasTemperature library are linked to the code. The sensor pin is defined followed by the OneWire library and DallasTemperature library instances established. The setup launches the serial connection and sensor connection. The loop contains the control program that will run continuously after the setup. It begins by requesting the information from the sensor instance. It then prints the value to the serial monitor. output temperatures from a RW1820 sensor to the serial monitor. With the board loaded with the program and all the connections made the module will begin to output a temperature in Celsius. The animation below shows a brief loop of the sensor being placed under a hot cup of water. Using multiple temperature sensors - changing the number "0" in "sensors.getTempCByIndex(0)"
Use the DallasTemperature library to produce the output in Fahrenheit.